Kelly Gardiner is a writer, editor and educator. Her latest book is 1917: Australia’s Great War, set on the Western Front and in Melbourne during the First World War. Her previous book, Goddess, is a novel based on the remarkable life of the seventeenth century French swordswoman and opera singer, Julie d’Aubigny. 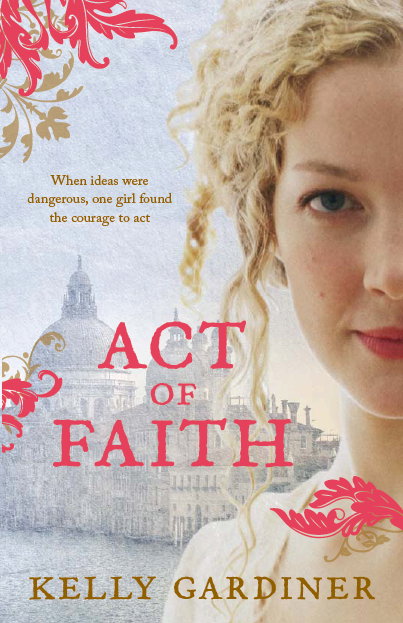 Her other books include The Sultan’s Eyes and Act of Faith, historical novels for young adults set during the time of the English Civil Wars and the Inquisition. Both books were shortlisted for the Ethel Turner Prize in the NSW Premier’s Literary Awards and Act of Faith was also shortlisted for the Gold Inky Award, and Highly Commended in the Barbara Jefferis Award. Both were Children’s Book Council of Australia’s Notable Books. Her books for younger readers are the ‘Swashbuckler’ adventure trilogy – Ocean Without End, The Pirate’s Revenge and The Silver Swan – and a picture book, Billabong Bill’s Bushfire Christmas. Kelly has worked on newspapers, magazines, and websites, and her features, book reviews and travel writing have appeared in magazines and newspapers including The New York Times, Marie Claire, New Idea, and Australian Good Taste. Her poems have been published in journals such as Southerly, Going Down Swinging, The Australian Women’s Book Review, Mattoid and Veranda. Kelly worked at the State Library of Victoria for ten years, and now teaches Creative and Professional Writing at La Trobe University. She has a PhD in English (Creative Writing) and Master of Arts in Australian literature.